The Book Everyone is Talking About . . .
A clandestine project to clean up oil spills goes terribly wrong. The all-too-possible global devastation that follows is but one way that man can easily tip the balance of nature too far. This story is about man’s arrogance, ignorance, greed and self-annihilation. Super-imaginative stories supported by scientific fact! Fiction so real, you know it could actually happen! Every once in a while, an author comes out of nowhere and rattles the cage of the book world with imaginative writing that’s so good, it begs for a new genre of its own. James D. Tesar is one of those authors. The genre? It should/could be named Factual Fiction. With an endless well of imaginative concepts that are supported by realistic potential, James has been feverishly writing stories that will finally be released to the public. 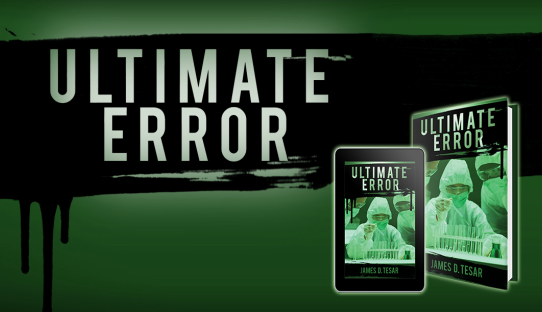 Preliminary readings of his first book, ULTIMATE ERROR have already caused a subtle rumble, muffled only by the binding agreement to keep this amazing story under wraps until its debut. JamesTesar.com is the official site of this author’s works. Here you will find information first and sneak peeks of his upcoming works. Take a look around to find out more about this author, when his works will be released and even ensure you’re the first to receive his upcoming books by pre-ordering. Find out about this imaginative book writer! Get a quick description of this amazing story! Are you a survivalist or extinctionist?